In this Cold Steel Finn Wolf review, we are going to take a look at an amazing folding knife with a Scandi grind blade. Based on a classic Finnish knife, the Finn Wolf from Cold Steel is a sleek looking folding knife that is up for any challenge. At an extremely affordable price, this knife is packed with great features all around. 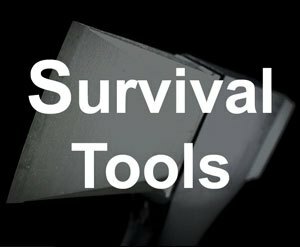 These include Cold Steel’s Tri-Ad Lock folding mechanism, reversible pocket clip, easy to sharpen Japanese stainless steel blade, and a comfortable, safe handle. 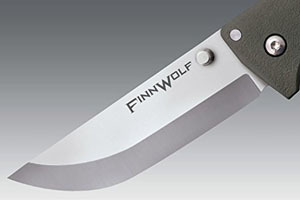 Designed primarily for use as an everyday carry pocket knife, the Finn Wolf also excels as a camping and utility knife given its rugged design. Let's go dive into the knife's features next. The unique design of this knife is based on a traditional Finnish knife, the Puukko. These knives have a unique shape. The knife features a long, curved cutting side and a flat back. This distinct shape has resulted in functional blades for years and years of Finnish history. It is commonly known as a Scandinavian grind. In fact, the Puukko still plays a prominent role in Finnish culture today. They are given as gifts as a show of respect. Now, insert Cold Steel’s president, Lynn Thompson, into the rich history of this knife. As a knife expert, he respected the usefulness and looks of the classic Puukko. His company, in conjunction with esteemed custom knife maker Andrew Demko, created a modern, folding rendition of the Puukko in the Finn Wolf. Keeping the same blade style for similar usefulness, Cold Steel put their modern touch on a timeless classic. Cold Steel produced knives in California for nearly four decades. 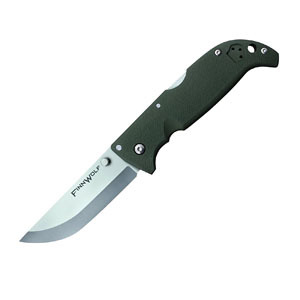 Their Tri-Ad Lock folding mechanism and popular Tanto blade are well respected throughout the industry. While they are on the more cost-effective side of knife producers, Cold Steel is known for making exceptionally durable, high-strength knives. 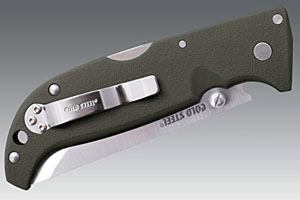 When buying a Cold Steel folding knife, rest assured that you are getting a high-quality product. This knife’s unique look stands out when compared to most other pocket knives. The shape of the classically inspired blade has been discussed. However, it is worth mentioning again this knife’s sleek look. Coupled with a few vibrant handle colors, this knife stands out in a pack. The handle is available in a neon orange, candy apple red, OD green, and a bright blue. 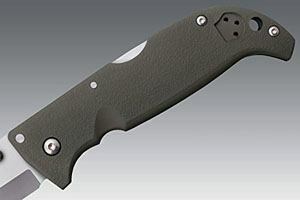 Another excellent feature of this affordable knife is Cold Steel’s Tri-Ad Lock folding mechanism. As the name suggests, this folding mechanism locks the opened blade into place three ways. These three features include a stop pin, a rocker pin, and a rocker/lock combo. The rocker/lock combo features a deep notch that butts a flat part of the blade up against a flat part of the tang mate in the handle. The rocker and the lock face in opposite directions to allow for more power. Essentially, think of hooking your two index fingers and pulling them against each other. The downward pressure applied while cutting pushes the rocker of the blade against the lock of the tang mate and forces them together. This evenly spreads the pressure throughout the whole knife and gives it similar properties to a knife with a full tang blade. 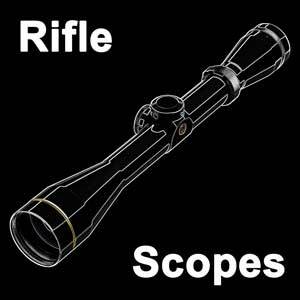 The constant metal-to-metal contact allows for an extreme increase in cutting strength. The rocker pin prevents the blade from wobbling back and forth and increases the safety of the knife. Thanks to the Tri-Ad Lock, the Finn Wolf lives up to its name and heritage of strong Puukko blades. 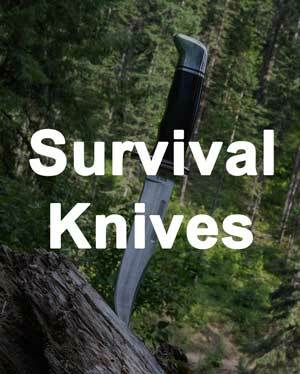 The knife contains a 3.5 inch long and 0.12 inch thick blade made out of a fairly high-quality Japanese steel, AUS 8A. While there are more expensive steels available, AUS 8A is well respected in the knife industry and is very commonly used. It is a cheaper stainless steel, but it is still known for its ability to be sharpened to a very fine edge. Some will say that it will dull faster than more expensive steels, but it is commonly accepted because it is easy to sharpen. With normal knife maintenance, you will have no problem keeping this blade sharp. Finally, the blade is satin polished to add some shine to its already unique appearance. With a reversible pocket clip and a lightweight frame, this knife excels as an everyday carry knife. The reversible pocket clip allows both left-handed and right-handed users to carry it. At only 3.4 ounces and less than 4.5 inches long when closed, this knife is the ideal size to be an everyday carry knife. The end of the handle that faces up in your pocket has a long, sloping curve. 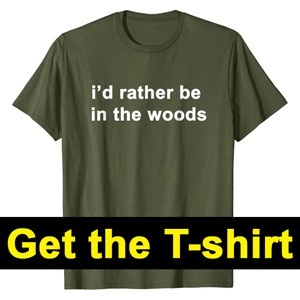 It will not catch on anything when you take it out of your pocket. Using the thumb pin to open the knife before use is fairly easy as well. Finally, the knife’s handle allows for safe, comfortable use. 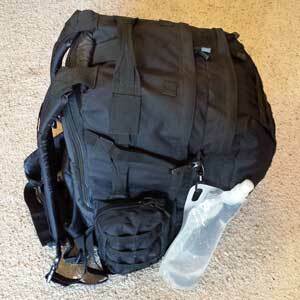 The handle is made of Griv-Ex, a fiberglass reinforced plastic. 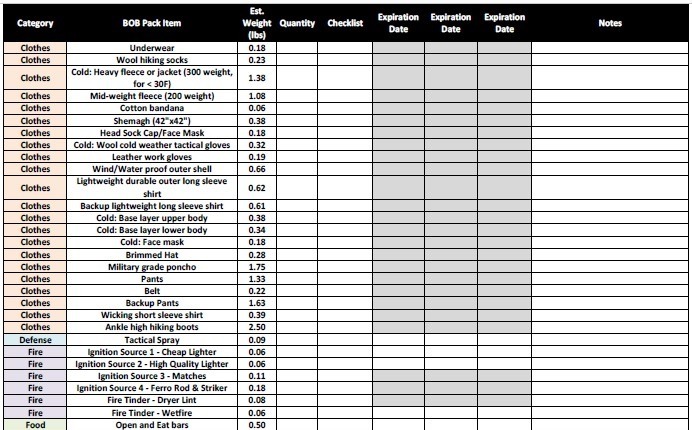 Using this material, Cold Steel reduced the weight while maintaining a safe, non-slip grip. The handle is molded to fit your hand and has a deep indentation to prevent your hand from accidentally slipping towards the blade. 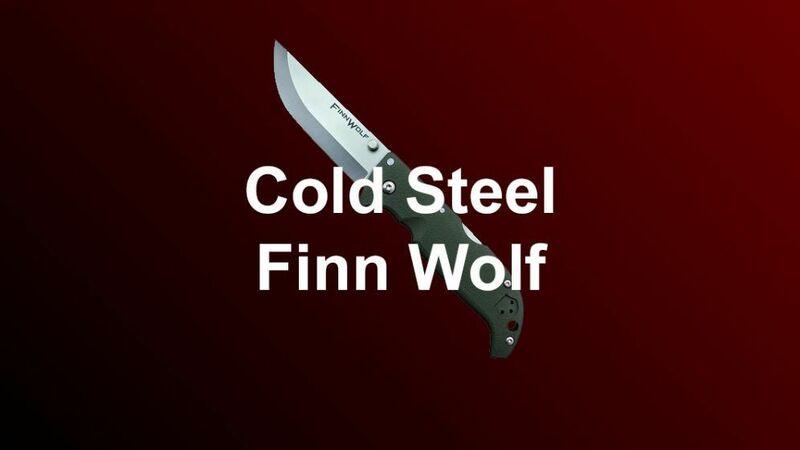 All in all, the Finn Wolf made by Cold Steel lives up to its name. 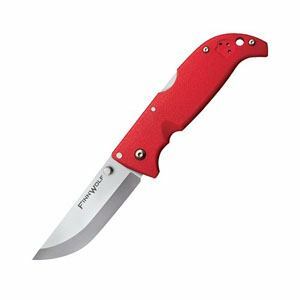 At an affordable price, this modern folding rendition of the classic Puukko knife provides plenty of cutting strength thanks to the Tri-Ad Lock folding mechanism. 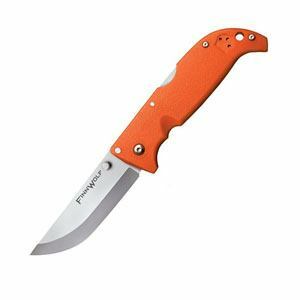 Packed into an impressively lightweight frame with a reversible pocket clip, this knife makes an excellent everyday carry knife. The classic look of this knife stands out in a crowd. 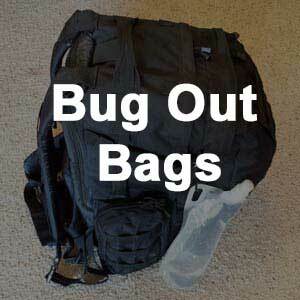 The handle allows for safe, comfortable use over time. While we wish it were available with a higher quality steel, this knife still proves to be sharp when treated correctly and sharpened as needed. In our opinion, it is one of the best Cold Steel knives that you can get.